Though it’s the highest growth rate of the expansion so far, 3 percent is a lower nominal growth rate than earlier periods when unemployment was as low as it is today (3.7 percent). That’s partly of function of slack still left in the job market, low productivity growth, and low inflation. Nevertheless, many economic commentators have argued that as tight labor markets push up wage growth, faster inflation will follow, as employers pass through higher labor costs to consumers. Anecdotal news reports back this up, suggesting that after years of historically low inflation, employers are finally feeling some pricing power, which they’ll use to help maintain their profit margins as labor costs rise. This note examines the validity of that claim in today’s US economy. Using data covering about the last 30 years, I find that while wages and prices correlate, the correlation has fallen over those years and, at least in the national data, there’s little evidence that faster wage growth will lead to faster price growth. To be clear, this is not a claim that inflation will stay around where it is today as the economy continues to close in on full capacity. But it is a claim that if price growth does accelerate, it will not necessarily be due to faster wage growth. To avoid cherry-picking, wage analysts often use principal components analysis to combine various wage series (such analysis works like a weighted average, down-weighting noisier relative to more stable series to extract a more representative signal of underlying wage growth). My version, which mashes up five wage and compensation series (including the two noted above) is shown in Figure 1. The series is quite cyclical, suggesting there’s a wage Phillips curve through which slack maps onto the pace of wage growth, along with the other determinants noted above: inflation and productivity (changes in labor-force demographics matter too). Most recently, nominal wage growth bottomed out at around 1.5 percent in late 2012 and is now closing in on 3 percent. 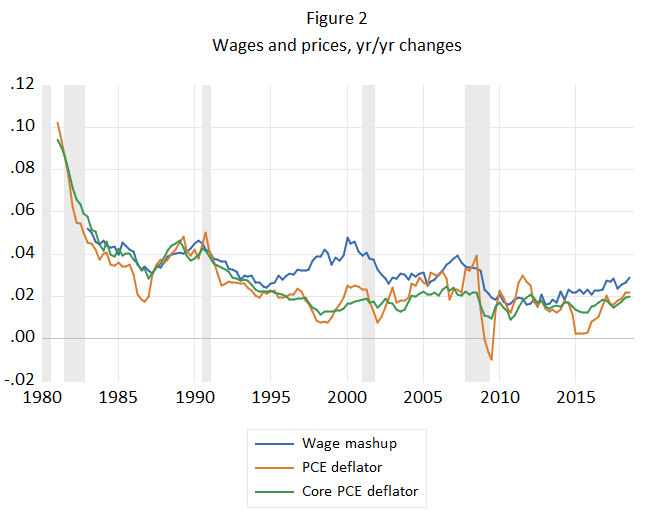 Figure 2 adds two inflation series to the wage series, also in yr/yr changes: the PCE deflator and the core PCE deflator. A few key patterns appear. While wage growth has gone up and down since the mid-1990s, price growth, especially the core index, has stayed “well-anchored” around the Federal Reserve’s 2 percent inflation target (though the target was only formalized in 2012). 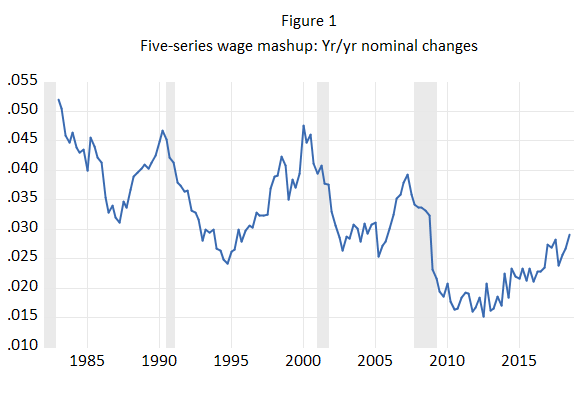 Due to data constraints, my 5-wage mashup series only starts in the early 1980s, but a longer series (Figure 2b), the BLS production, non-supervisory series that begins in 1964, shows roughly the same pattern with the same break point in the mid-1990s. The rectangle at the end of the figure highlights the most recent dynamics of this relationship, with the wage clearly accelerating and the core price index stable at 2 percent, where it has been for the past five months. Of course, these few data points don’t make a statistical case regarding passthrough, so for that we turn to simple models of the process. I begin with a simple model using quarterly data to regress yearly PCE price changes on the lagged wage series from Figure 1, import and energy price controls, and a measure of labor market slack. 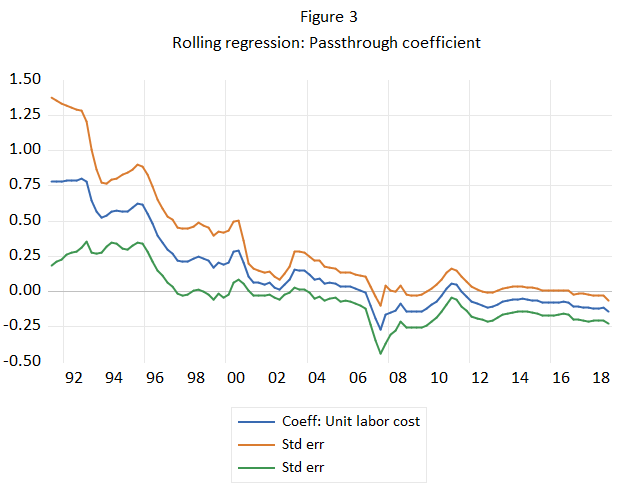 However, passthrough regressions typically adjust for productivity growth so that the variable measures unit labor costs. The theoretical rationale is that to the extent that productivity improvements offset higher labor costs, price passthrough is less needed to maintain margins. The regression also includes a lag of the DV. ULCs are measures of compensation per unit of output and are constructed in this case as yr/yr nominal wage growth (using the 5-series mashup series) minus yr/yr productivity growth. However, it is notable that the results hold if I use just the wage, unadjusted for productivity growth, or if I swap in the BLS ULC series for my constructed version. To smooth out the volatility in the wage and productivity series, I use a three-year moving average for both variables. Again, results are similar without the smoothing. To capture the changing nature of the passthrough, I run rolling regressions in 10-year windows. The plot of the ULC coefficient around its 95 percent confidence intervals is plotted below (Figure 3). The passthrough starts out both economically and statistically significant and then falls to essentially zero around the mid-2000s. As the next figure reveals, running a VAR with the same variables (with six-quarter lags in prices and ULCs), and then shocking the ULC variable generates the same result. The price response function is flat and the confidence intervals consistently cross zero. 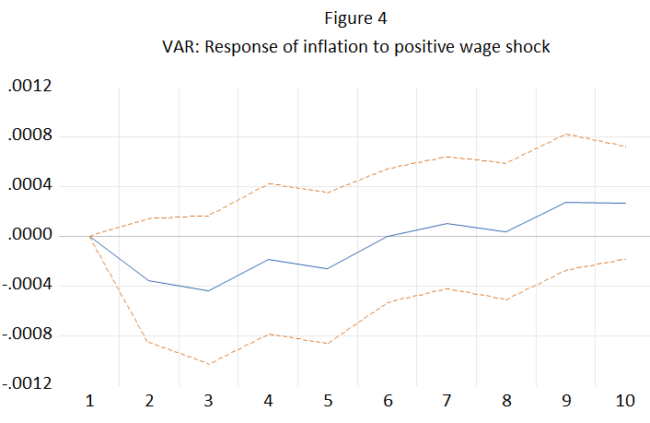 Finally, a test with four lags finds that inflation “Granger-causes” productivity-adjusted wages (the null hypothesis that this isn’t the case is rejected), but not the other way around, with the latter being the passthrough channel. 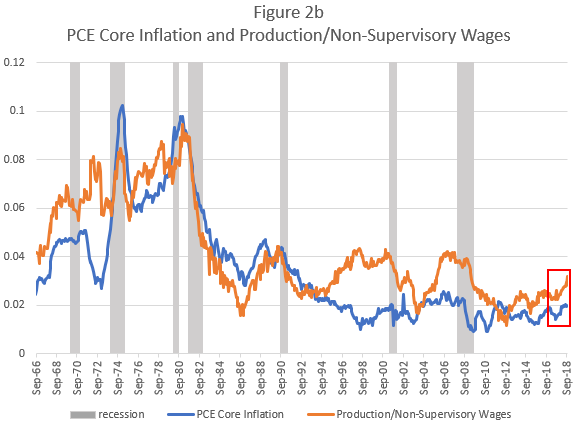 Summarizing, based on this evidence, the recent acceleration in wage growth may not bleed into price growth as much as some recent commentary suggests, as this passthrough relationship has significantly weakened over time. Notably, other more extensive research by Federal Reserve economists comes to similar conclusions. There are, however, a few important caveats. For most of the past decade, the Fed’s key policy rate has been at zero, the labor market was slack, and inflation was below target. None of those conditions prevail today, and even while some were controlled for in the above analysis, it is possible that earlier passthrough patterns could return. Also, national data of the type used herein can obscure important difference across geographical areas. Most germanely, research by Goldman Sachs economists (behind a paywall) has shown that even while national price Phillips Curves have been flat, those in various cities have had fairly steep slopes. It would thus be useful to look for passthrough in panels of geographical units over time. Of course, if passthrough does show up in that framework, such results, in tandem with those above, suggest that in non-metro areas, passthrough must be extremely muted. At any rate, the findings suggest yet another reason for a data-driven Federal Reserve to carefully test all assumptions about the extent to which our historically tight labor market will lead to lead to wage gains that will, in turn, push up prices. There are a few links in that chain, and they’re not as binding as many appear to think. Data note: All data are from BLS or BEA, with the exception of the CBO natural rate variable, used to construct the labor market slack variable (unemployment – natural rate). Update: I just stumbled on a new piece from Daan Struyven from the GS research team who runs a similar analysis to that above but with arguably better data, and he finds significant passthrough (behind a paywall). He uses a panel data set of 167 industries covering the years 1998-2017, finding that a one percentage-point wage (or ULC) acceleration raises the price level by about 0.4 percent cumulatively over two years, with about 2/3’s of the action in year one. Should wage growth accelerate by half-a-point–from 3 to 3.5 percent–core PCE inflation might then get a 20 basis point bump from the passthrough. As I intimated above, I like the panel approach better than my own, and suspect this model is picking up a more reliable signal. If so, that’s a feature, not a bug, for the future path of core prices, as symmetry around the Fed’s 2 percent target means that the years of downside misses must be offset by a period of above target inflation. Share the post "Does faster wage growth imply passthrough to faster price growth? Not necessarily. (Though see update at the end.)" One comment in reply to "Does faster wage growth imply passthrough to faster price growth? Not necessarily. (Though see update at the end.)" I’ve used the three moving average of the trailing CPI as a proxy for inflation expectations in a wage equation that has worked very well since the 1970s. However, it did say that wages should have fallen in the great recession.